Hispanolia (the island shared by present day Haiti and the Dominican Republic) was once full of splendid rain forests and fertile plains. Native Caribbeans inhabited the island for centuries before Columbus arrived in 1492. The Spanish, and soon after, the French, saw a land of opportunity. Spain and France divided Hispaniola in 1697 where the western 1/3 of the island became Haiti, ruled by the French and the other side ruled by Spain – present day Dominican Republic. Because the native population was largely killed off through warfare, slave labor, and European disease, people were kidnapped by the hundreds of thousands from Africa and shipped to the island for slave labor. In 1923, over 60% of Haiti was covered by lush forests; by 2006, less than 2% remained. Initially, forests were pillaged for their beautiful wood – to pay off foreign debt – mostly to France. Since then, the forests have been a source of fuel and jobs. In a desperate society, little thought is given to ‘tomorrow’ because they’re hungry today. How could this land that was once so productive be so barren? France invested A LOT of money in their jewel colony. After the slaves rose up and freed themselves in 1804, France was humiliated and sought retaliation by petitioning other European nations & the U.S. to boycott the New Haiti. If France couldn’t have the goods, nobody would. It wasn’t hard to get cooperation — the U.S. and many European nations still had slaves; the idea that anyone would trade with a country of former slaves and now the world’s first black republic would send the wrong message to their own enslaved population. The result? An international boycott of Haiti’s goods and commerce plunged the Haitian economy into chaos. 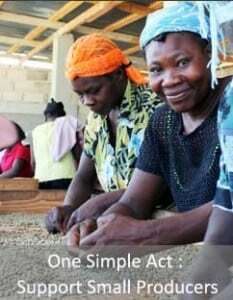 150 million francs [estimated at $21 billion in today’s money] would allow Haiti to export its goods. How’d they pay? They paid, in part, with their trees. Forests full of glorious mahogany and other beautiful species were leveled and shipped to Europe to pay the ransom. This debt plagued Haiti for over 80 years and was finally paid off in 1922. In the meantime, Haiti paid the debt many times over in interest alone. It is difficult to measure the harm this caused, but by conservative measures, it was significant to their economy AND environment. The need for fuel. Haiti has no fuel except wood. People cook with charcoal. This requires massive amounts of wood to provide fuel for 9 million people. Thus the demand on wood as a crop is the immediate cause of denuding mountains of Haiti. The need to earn a living. People are hungry. They have little available work. Wood is in constant demand as charcoal and they will argue they have no alternative. Making a living off of charcoal is possible. Ignorance. Because of illiteracy and lack of education, Haitian wood cutters do not fully understand the implications of decimating forests. Uneducated peasants have little sense of history. In their generation, Haiti has always looked deforested. When faced with hunger, the argument makes no sense. Lack of motivation to reform. There is little motivation for wood cutters to replant trees because they do not own the land. They cut here or there as sharecroppers or renters, then move on to other lands. The land owners are often city people or more wealthy village folks, and they do not keep a close watch on their lands. Were they to replant, it is likely that the neighbors’ animals would eat seedlings since there is little forage left. Reforestation is vital for Haiti’s future. Trees are essential in reducing or preventing flash flooding; a single tree can intercept 1000 gallons of water annually when fully grown. Plus, underground water-holding aquifers are recharged with a slowing of water runoff. Trees protect crops (and humans) from damaging effects of wind and sun. Trees clean the air and the soil by intercepting particles, reducing heat, absorbing pollutants. Trees provide beauty and majesty to barren landscapes. 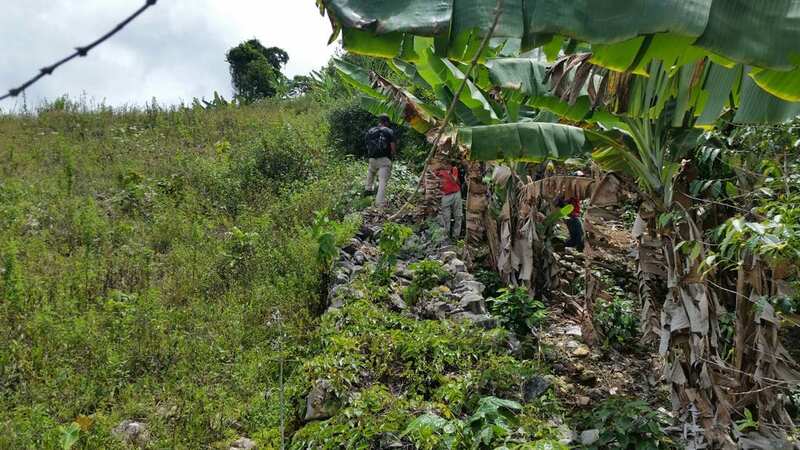 Haiti has a long road to environmental recovery, and there are many groups in Haiti who are working to restore the land. We’re doing our part at Singing Rooster where coffee trees are playing a significant role. 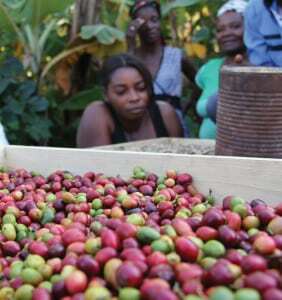 Half of Haiti’s 5% forested lands are coffee plants. Farmers want jobs, not handouts. Coffee trees provide a living while protecting the forests. Why? They won’t cut them down because they’re income-providing. PLUS, coffee trees are water intensive & therefore thrive in the shade of taller trees (i.e., they won’t cut down trees protecting coffee plants). Now add in this: coffee trees have an IDEAL root structure for holding delicate mountain soil in place (taps roots yes, but horizontal roots stretch for METERS). Coffee beans are the added bonus. 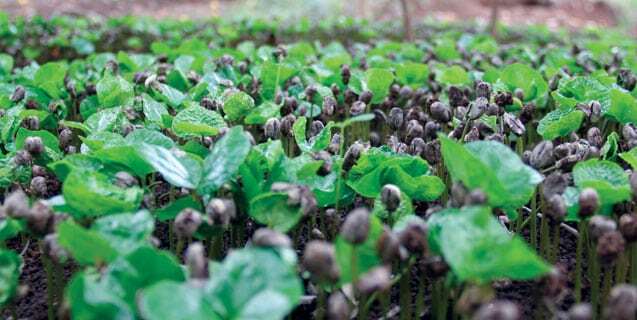 Can coffee trees reforest Haiti? We’re working on it. Haiti’s environmental problems were created, in part, by others. It’s our shared responsibility this Earth Day and beyond to help make things right.